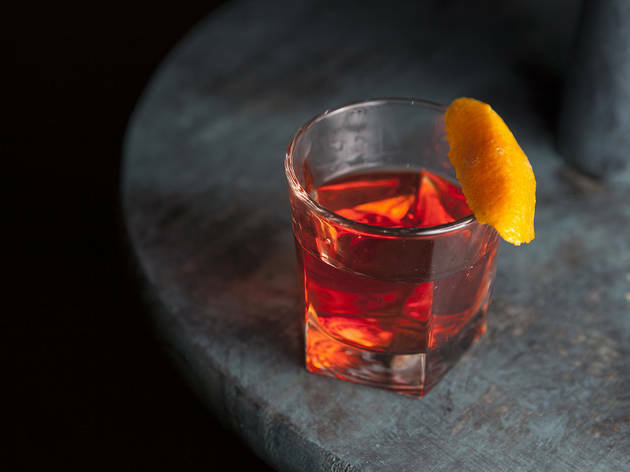 Satisfy your New Orleans itch with Sazeracs and po' boys at The Little Easy, a Downtown bar with Louisiana roots. 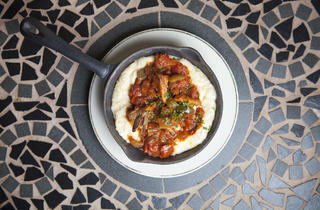 Welcome to the Little Easy, where live jazz plays in a charming French colonial courtyard dappled with chandelier light. 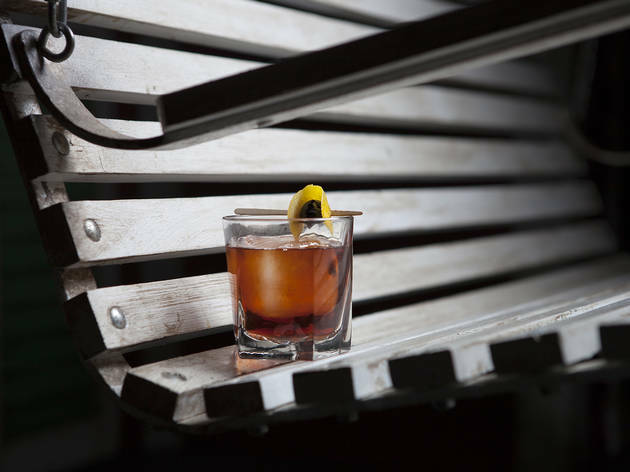 As you sip Sazerac between bites of catfish po’ boys, you just might forget where you are—which, by the way, is inside the basement of Downtown's century-old Alexandria Hotel. Thanks to a Disney-esque design—the centerpiece being an indoor patio complete with fountain, wrought-iron fence and distressed shutters—dive bar queen Vee Delgadillo (Bar 107, The Down & Out) has transformed the Gorbals space into an antebellum straight out of NOLA’s Garden District. All kitsch aside (yes, there are times you might feel as though you are dining at Disneyland's Blue Bayou), authentic Cajun fare by Mississippi-born chef Brian Garrigues paired with expertly crafted libations give The Little Easy some real down-South cred. For Angelenos in need of a little hospitality and deep-fried solace, it’s just what the doctor ordered. Good for: Satisfying a New Orleans itch. Bring a date and pretend like the two of you have jetted off to Mardi Gras. Dark corners and cozy worn-in sofas abound in the back “patio;” meanwhile, the French Quarter hotel lobby-inspired front room makes for superb after-work drinks. They take their swills seriously here, but that’s to be expected of a watering hole named after what many consider the birthplace of the cocktail. 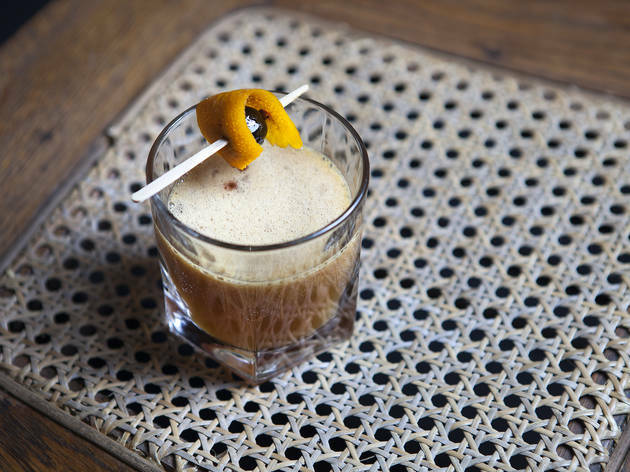 We’re talking iconic gems whipped up to perfection—from the deceitfully boozy NOLA native Vieux Carre ($12) to the aromatic 127-year-old Ramos Gin Fizz ($12). 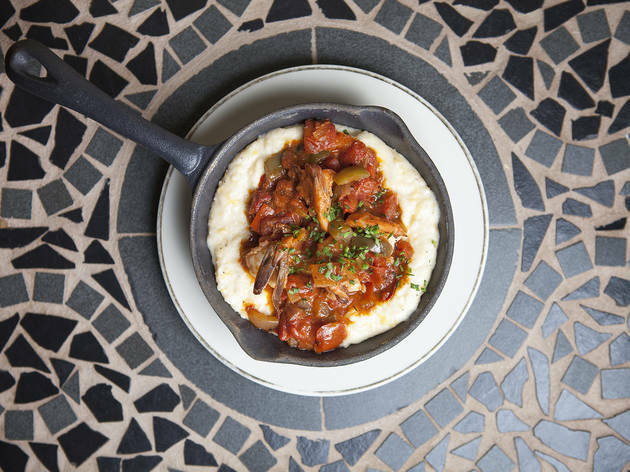 Make sure to save room for some of the best shrimp and grits ($13) outside of Louisiana—and, what the hell, you might as well throw in the beignets with chocolate lavender sauce ($7) while you’re at it. 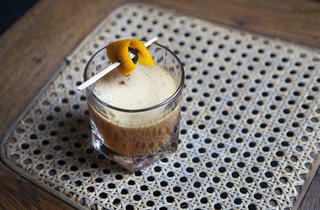 The scene: Toeing the line between neighborhood bar and craft cocktail haven, The Little Easy feels exclusive without being pretentious. Its Southern charm goes beyond decor: these bartenders are some of the friendliest you’ll ever encounter in LA. As far as atmosphere, don’t expect a New Orleans level of rowdiness. The thoroughly laid-back vibe makes this Historic Core hideaway a top choice for a tamer night out. The playlist: Talented four- and five-piece ensembles perform traditional jazz and blues throughout the evening. The best part: listening is free. The acoustics and mood lighting make for a great show. Bartender says: Authenticity is a priority. The Little Easy goes as far as to import the bread they use for their po’ boys, and the barkeeps know their New Orleans drink history like the back of their hand. On our visit, we learned from a gal named Fro that the Sazerac, the granddaddy of all cocktails, was covertly branded as medicine back in the day by a Creole apothecary named Antoine Amedie Peychaud, whom you may know for his bitters. Drink this: Surprise, surprise: The house specialty cocktail is a Sazerac ($12), a potent mix of rye whiskey, absinthe and bitters. 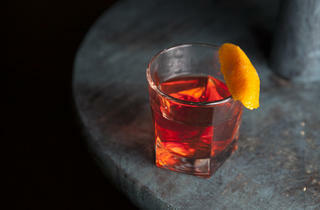 If you've had a Sazerac before, The Little Easy makes one of the best in town. If you haven't, you're in for a real treat (one that will likely get you drunk quickly). 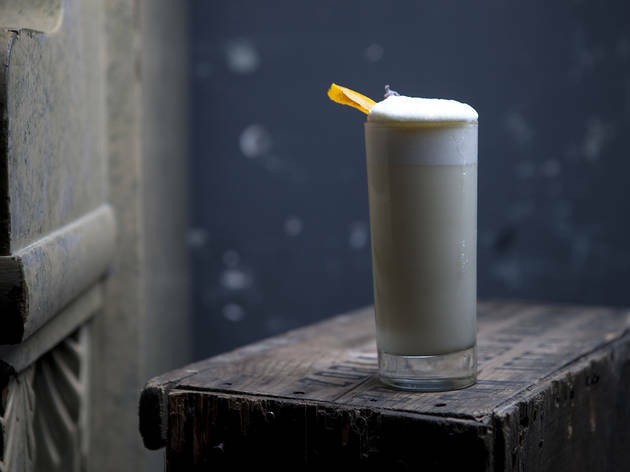 Another classic to add to your tab is the Ramos Gin Fizz ($12), a funky blend of gin, orange-flower water, lemon and lime juices, cream and egg whites that goes down all too easy. Question everything you’ve ever known about the Hurricane and order The Little Easy version ($12)—a combo of light and dark rums, passion fruit puree and orange juice, with a Pama float. Not only is it not blue (cool your jets), it’s also not sickeningly sweet. Craft cocktail connoisseurs, rejoice! A place I keep hearing about how amazing it is and eccentric it is, so I had to try it. Came here originally for a happy hour but for some reason they weren't open until 6pm! So my friend and I ventured somewhere else and then came back. 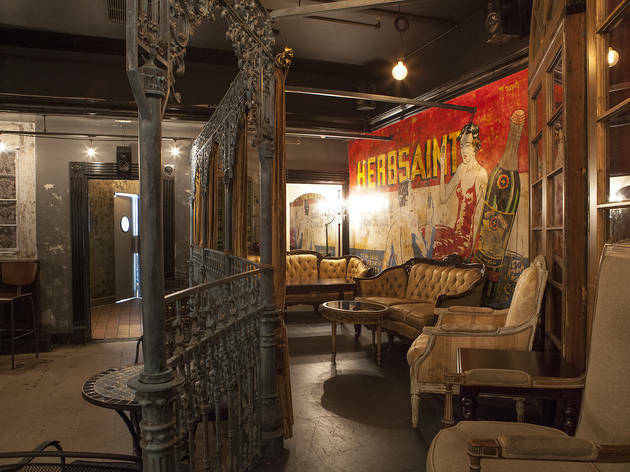 I think it's a very cool spot, very speakeasy like, as you have to meander to the back to where all the fun is with an indoor fountain and all the fun New Orleans themed decorations. They have a great happy hour too with food so it's definitely good. Be warned though everything here is pretty much fried! I typically don't eat fried foods but these were delicious. Apparently they have a solid lunch buffet here too so would definitely try that out next time. In the daytime, it's a New Orleans style brunch spot. In the nighttime, it's a hip hop haven. Only can the Little Easy make that switch possible! If you like bottomless mimosas and biscuits and gravy, this spot is the place to be! The food is well priced and delicious. The only downside is the restaurant is kind of dark which can leave you trying to remember what time of the day it is. 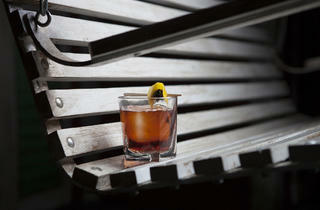 At night, the two bar situation is perfect for getting a drink quickly. The tables from brunch are left in their places which is a little strange but it's great if you want to sit and relax! The dance area is small, but there is a stage where people love to get up and shake it, and the DJ always plays jams! The perfect time to come is around 11:30pm or midnight. There's rarely a wait at the door and it's such a fun atmosphere! The drinks are nothing to write home about but they get the job done. Completely different vibe than most of the bars downtown. 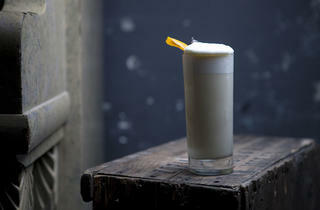 Stop by Little Easy and head to the back to be transported away from LA & very much into NOLA vibes. The backroom is large and dark and a fun environment to jump into - beware though that your cell phone probably won't get any service. Depending on when you arrive, the bars can be packed and often I've seen a younger and somewhat "bro-y" crowd (which makes sense as a handful of the drinks feel quickly mixed & more geared towards that crowd). Overall though, it is definitely a different environment from the other bars in the area and a fun place to check out. They also make an incredibly strong & delicious hurricane! Beware of that one, it will sneak up on you. This is a super low key, fun bar right down the street from Pershing Square. 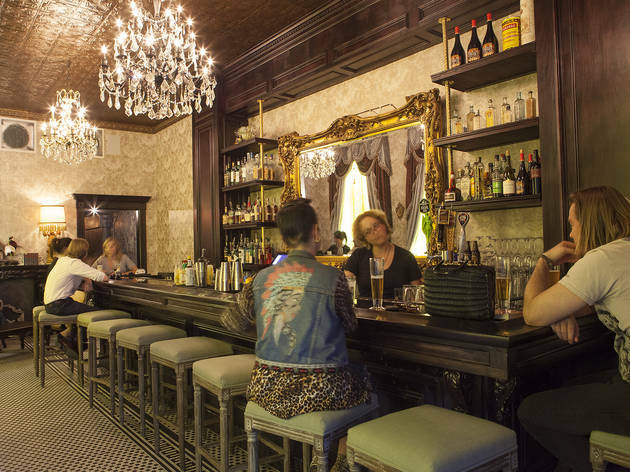 There are two bars technically - one in the front that has a very bougie plantation house feels, and one in the back that feels as if you're in (a very disneyish) version of the French Quarter. They have awesome drinks and tons of seating. I've only been here at off times so I'm not entirely sure how crazy it gets but it's always a good time. Drinks are good and not too expensive and then bartenders are always a good time. Head here after you stop at the Last Bookstore! I really want to give this place 5 stars, but I had to knock off a star due to their time constraints during Sunday brunch. It was raining, so my hubby dropped me off while he went to find parking. Initially you walk into a bar area where you can grab a cocktail while you wait for a seat. I walked down the hallway into the dimly lit restaurant area and immediately fell in love. I asked the bartender if I could sit anywhere and she responded, "Yes." Initially I sat at one of the high back, two seat tables, but my chair was wobbly, so I moved over to the couch area. I don't think I was supposed to sit there because I heard the server tell the next couple who came in to "sit at any of the small tables." After I heard this, I asked the server if he wanted me to move and he said, "Don't worry about it." Morgan was my server and he was friendly and attentive. He came over to me twice to see if I was ready to order my drink, but I advised him I was going to wait for my hubby because I wasn't sure if we were going to do bottomless mimosas. Before going to the restaurant I did some quick research and saw bottomless mimosas were $10. Well when I looked at the menu, it said mimosas were $10 on Saturdays, but $20 on Sundays. $20 seemed high since most places charge between $10 and $15. I thought about going somewhere else, but the vibe in this place was so cool, I was willing to fork out the extra few bucks to enjoy the atmosphere. My hubby finally got to the restaurant around 10:40 am, and we ordered the bottomless mimosas, which have a 2 hr time limit. At around 12:00 p.m. Morgan told us we had 15 minutes left for mimosas. I didn't feel like pointing out the fact that we didn't start drinking mimosas until after 10:40 am, and we should actually have more time. Morgan came back by and filled up our last mimosa. Hubby and I savored the last glass and continued to take our time enjoying the live music. Suddenly, a staff member came up to us and told us we needed to leave because there were other people waiting. This really killed our experience here. There was a sign on the table that said "2 hour limit." I assumed that the sign was just for the mimosas, but I guess there is also a time limit for sitting there. Besides the time constraint, everything else was great. I'm super picky about chicken and their chicken & waffles were amazing. The chicken was super moist and the batter was perfectly seasoned. I'm not a big gravy fan, but their gravy was delicious! The oj in the mimosas tasted fresh and had just the perfect amount of sweetness. 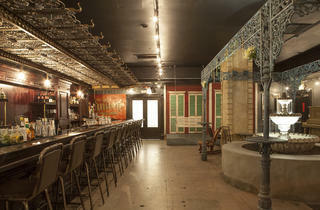 If you're looking for a NOLA themed bar with a bonus speakeasy feel, look no further! 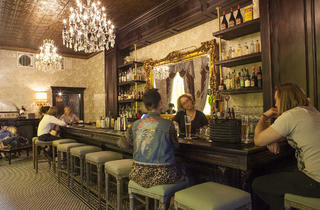 Prim and proper small bar up front, but wind through the hallway to the back, where a dark, music filled terrace awaits. As another reviewer notes, it's like being on a Disneyland set--but in the best way. Drinks are good, food is good, live music is great fun! A great place to go for an exciting night, not best if you're looking to do a lot of talking due to the noise levels (unless you stick to the upfront bar). I dig this place! 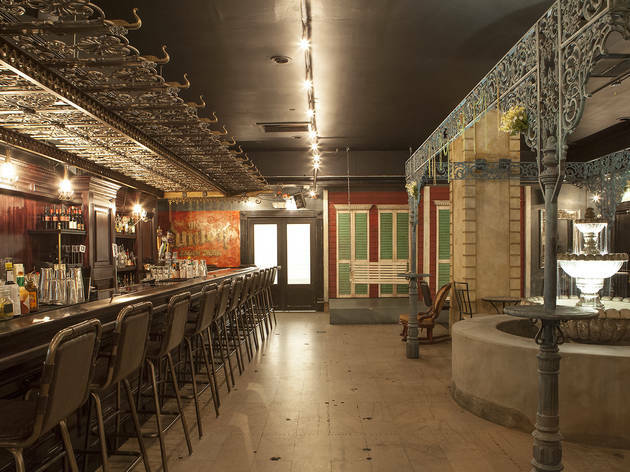 The back room is a beautiful ode to New Orleans architecture, and the live acts that take place most nights are a fantastic way to pass an evening Downtown. I've had a couple really great drinks here and some not so great ones, but the bartenders are always friendly and willing to talk with you about what you're in the mood for. It's a nice spot fora date, too! Little Easy is in DTLA and makes you feel like you walked into New Orleans! It's a terrific place to have some cocktails after work or to go on Sunday's when they have live performances! 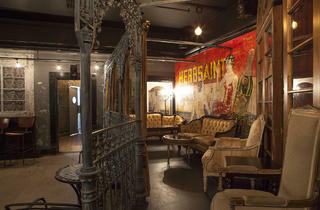 The decor is also very cool and unlike most bars DTLA! The Little Easy is tucked into DTLA and appears as a hole in the wall from the outside. When you walk past the bar and down the mirrored hallway you are transported to a Disneyfied New Orleans experience (I mean that as a compliment) with delicious food and drinks. Think Blue Bayou without the raft of tourists floating by. LA is quickly becoming a Little New Orleans with some many NOLA inspired restaurants and bars popping up across the city. The Little Easy stand out among the crowd as the perfect of blending of quality, taste, and the complete lack of kitsch. The interior is really stunning and both bar rooms play well on the classic and diverse New Orleans style architecture and atmosphere. When ordering you should definitely go for the true Southern classic of Milk Punch, which is only rivaled in LA by Faith & Flower.